This year the WW1 quilts tour comes to a close but not before being shown at two prestigious exhibition spaces. 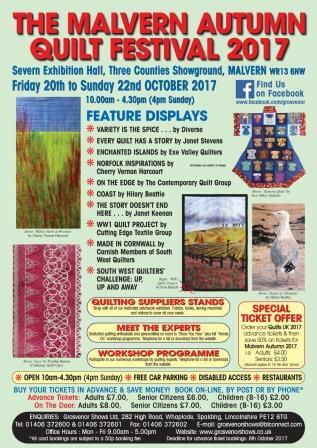 The flyer for the Autumn Quilt show is now in circulation and features Fran Barrett’s quilt! We also have an article about the quilts that has been published in the October issue of the Patchwork & Quilting magazine which is out on 15 September. And on 7 August Monica Dennis was on Radio Cardiff talking about the quilts and promoting the above events.